Social: 5:30 p.m Dinner seating: 6:30 p.m.
After some welcoming remarks by MC Don Cameron, the program's Chair Russ Woloshyn, and KSA President Bill Pegg, sports groups involved with KSA's Fee-assistance Program were called forward to receive their cheques from Gord Dearborn, Chair of the Fee-assistance Committee. Angelica and Ron Daniels, parents of Joey Daniels, were on hand to accept a cheque for $250 (KSA Athletic Excellence Program) on behalf of Joey and extend his gratitude for the recognition and support. Joey is a hurdler who competes for Supreme Athletics,Canada at the international level and Princeton (where he's currently in his 2nd year on an athletic scholarship. After grace by Dave McLelland, a delicious 3-course dinner and some socializing, the following 23 sports groups honoured one of their key volunteers. Congratulations to those recognized tonight for their volunteer contributions and all those who participated in the proceedings to make this a very special night. 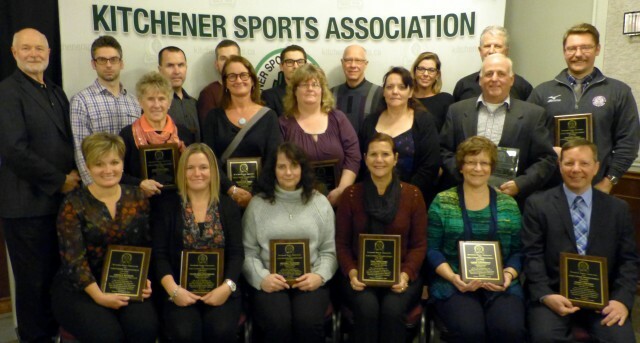 Our local sports groups benefit from the efforts of thousands of local volunteers and couldn't operate without them.Thanks one and all --- you do make a difference! If you want your group to be included in the celebration next year, please submit submit your nomination paperwork by the deadline (early November 2018).